The ballots are in and the votes are tallied. The winner is … chicken. That’s right, we recently polled you about the protein you grill most often. It wasn’t beef, it wasn’t pork, and it certainly wasn’t lamb. It was chicken. Not that we’re surprised, because as you travel the world’s barbecue trail, you find chicken in every grill culture. From Jamaican jerk chicken to Japanese yakitori. From Indian chicken tandoori to Peruvian chili-marinated rotisserie chicken. 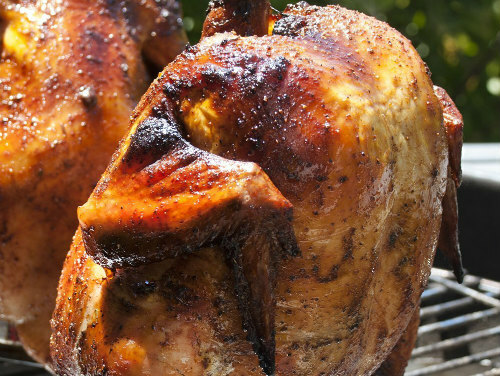 Of course, we Americans certainly do our part when it comes to grilled and smoked chicken. In the week leading up to the Fourth of July alone, we bought 700 million pounds of this bodacious bird, nearly all of it destined for our grills. So it will come as no surprised that “chicken” is one of the most searched terms on BarbecueBible.com. We never tire of new ways to grill or smoke it. Smoked-Roasted Chicken with Horseradish Dip: Our take on the chicken with white barbecue sauce that’s made Big Bob Gibson Bar-B-Q in Decatur, Alabama. 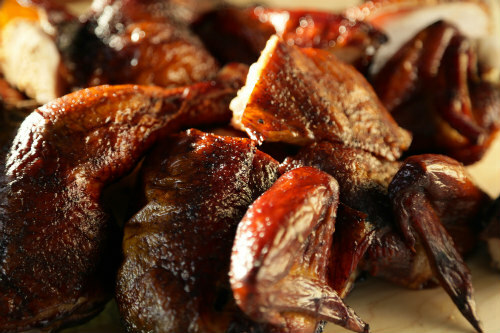 Mayonnaise, vinegar, and horseradish make this one of the world’s most distinctive barbecued birds. 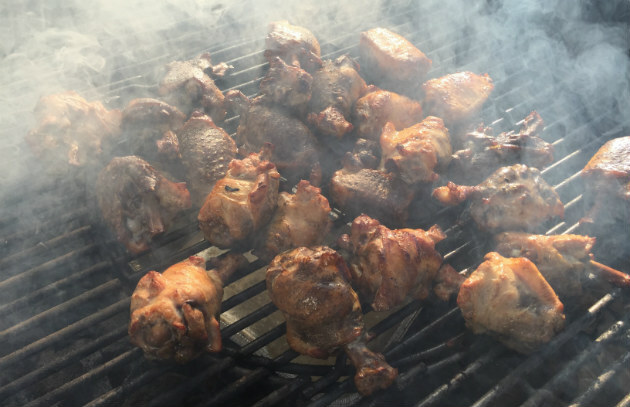 Jamaican Jerk Chicken: You know about jerk pork, but Jamaica’s fiery scotch bonnet and allspice seasoning makes a hell of a grilled chicken. 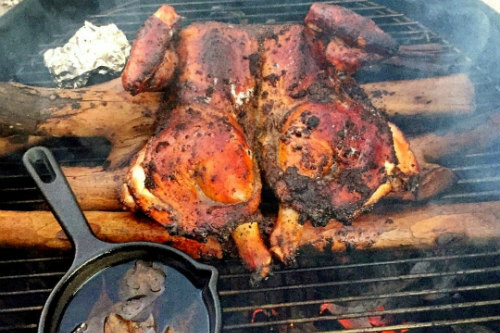 In Jamaica, the bird would be spatchcocked and slow-grilled over an allspice wood fire. 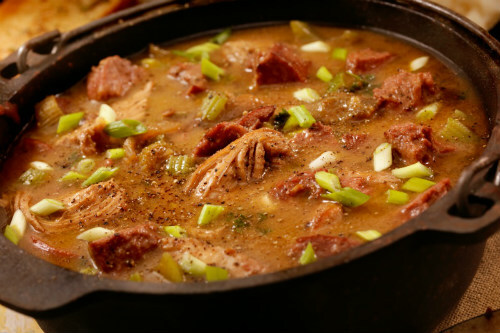 Smoked Chicken and Sausage Gumbo: Our third most popular chicken dish is a Louisiana-style gumbo flavored with home-smoked chicken and andouille. For extra points—and flavor—simmer it in a smoker. 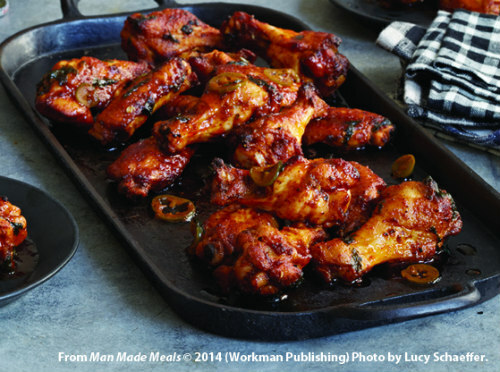 Fire-Eater Chicken Wings: The Raichlen take on the Buffalo wing features spice-rubbed, smoked (not deep-fried) chicken wings. The sauce is a high voltage combination of butter, hot sauce, and fresh jalapeños. Piri Piri Chicken Wings: Another high voltage wing, this one from South Africa by way of Brazil. (The piri piri chili is native to Brazil.) Have plenty of beer on hand for this one. Beer-Can Chicken: I first encountered—and wrote—about beer-can chicken in 1996. Thanks to the upright position of the bird and internal steaming, this is still one of the best ways I know to smoke-roast a whole chicken.